Not all the contributors are women (16 of the 21 are) and the subjects of each chapter are fairly roughly divided between men and women. The authors insist on the centrality of cultural history and feminist analysis in understanding global circulation and interconnectedness. 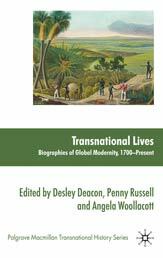 The book is part of the Palgrave Macmillan Transnational History Series and is a scholarly text with academic contributors, several of whom have written full-length books about the people featured in these chapters. Some chapters are more theoretical than others. There is an art in combining a biographical approach with a more abstract academic question within a ten page chapter like this. I’ve found in giving papers at conferences about my own largely-biographical project that listeners/readers crave the human story as something that they can hook onto at an interest level. While you as writer and researcher might want to use the biographical story as a springboard to explore larger questions, it’s the human story that attracts attention. It’s a tightly edited collection, in four parts, each introduced by the editors with a short preface. Part I, ‘Writing Lives Transnationally’ looks at the methodological issues in writing individual lives in a transnational context by examining Eunice Connolly, a largely unknown 19th century mariner’s wife; Sara Baartman, historically constituted as ‘The Hottentot Venus’; an exploration of mapping and naming and its effect on Aboriginal identity; and Charles Michel Mouet de Langlade, the son of an Anishinaabe woman and a French trader on the Great Lakes. Part II ‘Opportunities’ is divided again into three subsections: ‘Fantasies’ examines the 19th century case of John Dow and Viscount Lascelles in which it is unclear whether it was imposture or delusion, and the lifestories Cliff Richard, Engelbert Humperdinck and Merle Oberon, who were reticent or evasive about their transnational backgrounds while in the glare of celebrity. The ‘Livelihoods’ section explores crossing boundaries as part of a career: Herbert Hoover as an engineer; Aboriginal man Manyat as he guided explorers in Western Australia in the 1830s; and Elihu Yale (of Yale University fame) who made his fortune through employment with the British East India Company in the late 17th century. The final subsection, ‘Performances’ looked at the theatrical careers of Margaret Anglin 1890-1940 and Katherine Dunham, choreographer and dancer in 1940s-60s. Part III ‘Quests’ involves two types of crossings. The first are political crossings, looking for liberty and justice through African American Colonists in Liberia in the 19th century, and Anthony Martin Fernando the Australian Aboriginal protestor who took his campaign to Europe in the early 20th century. The second type of crossing is the intimate crossing, looking for love, which explores Jane Franklin’s attempt to garner international support for the search for her husband Sir John Franklin in the Arctic, and Mary Berenson, who migrated from America to Britain and then Italy, where she saw herself as part of an international and cosmopolitan elite of scholars and connoisseurs in the fine arts. Part IV picks up on these theme of cosmopolitanism (indeed, the chapter on Berenson could fit just as easily in this section) with the mirrored sections ‘The World at Home’ and ‘At Home in the World’. The first examined Lowe Kong Meng, a Chinese businessman living in Melbourne as the racial barrier came down increasingly on Chinese Australians at the end of the nineteenth century, and Judith Anderson, the Australian-born actress of stage and screen (who, I must admit I’d never heard of). The final section examines Michael Danos, the husband of Sheila Fitzpatrick, written in a way which combines the intimate and the academic; Donald Friend the artist who travelled widely but seemed compelled to keep returning home, and Rosita Forbes (again, someone I hadn’t heard of) a travel writer who saw herself operating on the world stage in the Middle East, as T. E. Lawrence had done. As you can see, there is a wide variety of lives explored here. I was less attracted to the ‘celebrity’ figures, probably because I didn’t recognize many of the names that were dropped as part of establishing their place in the theatrical, literary or artistic milieu in which they lived. I enjoyed the historiographical and methodological flavour of the first section in particular, although perhaps that reflects my interests at the time. I thought that the Cosmopolitan emphasis was interesting, and would have liked to have that teased out a bit further by the editors, possibly because I am not as familiar with the cultural studies approach on which it draws. One of the advantages of relatively short and varied chapters like this is that even if one chapter does not particularly appeal, it’s likely that the next one will. Far more than in other collections of essays that I have read, the chapters in this book spoke to each other and to the editors with several cross-references and comparisons drawn between one chapter and another. It was like being in an interesting conversation over an extended period of time, with people talking to each other, rather than at one another. The editors have been such a strong presence in this book that I felt a little as if I had been left dangling at the end, when I came to the last essay in the book. I would have welcomed them back, to round off the collection. 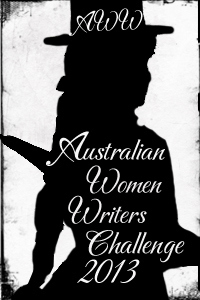 As the three editors of this collection are women, I am posting this review to the Australian Women Writers Challenge site. It is a scholarly text and is written at a fairly high level of abstraction. However, quite apart from the larger questions that the collection addresses, several of the chapters were interesting in their own right and range across a large range of lives, times and societies. Sharing stories is a fundamental aspect of the human condition. We need to interrogate history with sound application of theory but it is understandable that historians like everyone else, appreciate a strong narrative even though they may not always like to admit it.